Flower Mound, TX – Transportation Technology Services (TTS), recently acquired by BNSF Logistics, LLC, and Siemens Energy, Inc., jointly announced an exclusive arrangement to market and operate the KWUX 101, 20-axle Schnabel railcar. The railcar is available for immediate use across North America. This particular railcar was originally designed for specific Siemens transformers. However, the pin locations allow for the movement of a wide variety of OEM’s transformer designs. Additionally, engineers from TTS designed adapters that will allow a majority of transformer designs, including 7-leg designs, to be moved using this railcar. TTS/BNSF Logistics will manage, maintain and have priority access to the Schnabel railcar. 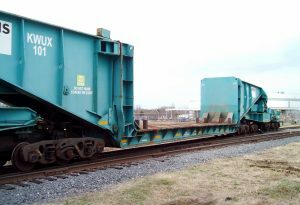 In addition to the KWUX 20-axle Schnabel railcar, TTS also owns three cabooses, three more Schnabel railcars, and two 12-axle flatcars. The KWUX Schnabel railcar will be stored in Rincon, GA, a suburb of Savannah, with TTS’ other Schnabel cars, cabooses, and 12-axle flatcars. TTS employs some of the most experienced operators in the industry. Further, the TTS team has the capabilities for designing technical drawings, developing shift plans, and providing full scope logistics planning for complex projects. Capacity with bridge 785,000 lbs. Weight of Railcar 529,000 lbs. Weight of Loading Bridge 228,000 lbs.